Star Trek: The Next Generation is a vile, repulsive television show, and no one will admit it. 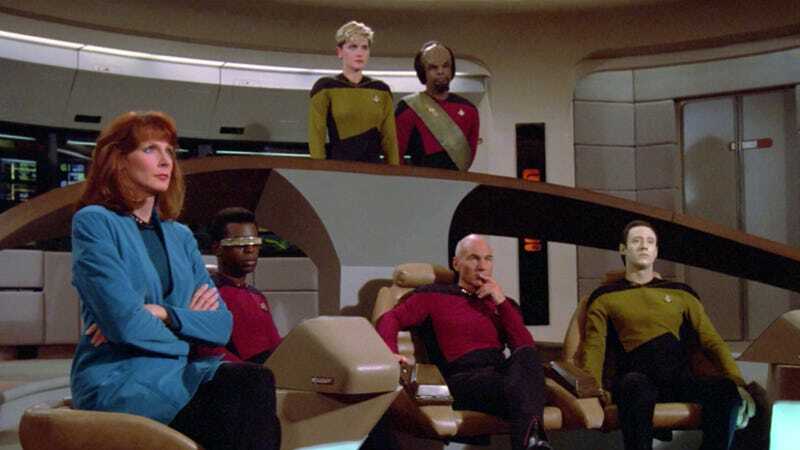 Hailed by some that I just made up as the best of the Treks for the way it re-booted an entire genre of space fiction, TNG reflected not a utopian future for citizens of the galaxy, as it believed itself, but a society where the basic norms of sentient decency completely broke down. I grew up watching TNG. Watching at night with my dad, followed by a brief smattering of Voyager, consists of some of my most vivid childhood memories. To its credit, the story lines were compelling, many of the characters were deep, and some culturally pertinent and relevant topics were ever-so-briefly hinted at. So consider this a labor of love. We'll be re-watching the entire series from beginning to end, enjoying its barely contemptible best moments, and mercilessly going at the worst of humanity that it represents, just like Captain Picard would. With each episode, we hope to maintain the critical eye that this beloved series so very much deserves. A very, very critical eye. So welcome to Re-Trek. It's going to be terrible.